That last parenthetical calls for a confession, doesn’t it? I haven’t written a sentence worth keeping all summer. Well, that’s not true. That’s not true at all. I’ve written some decent sentences, really I have. It’s paragraphs that are giving me a pain. I can’t make a paragraph. I haven’t written anything resembling a paragraph, not for the longest time. My excuse: I was working. I was traveling. I was grieving. Hmmm… Any of those might take me somewhere with the writing, no? It’s a matter of committing, that’s what it is. Follow the prompt. Give it five minutes. Give it 10, 20, 30 minutes. It’s not like you have something more important to do. It’s not like you have anything to lose. Is it? I know, I know, me too, me neither, I don’t like to write on the spot. and yet, I’m known for asking writers to write in the room; for doling out prompts, sometimes three at a time; for giving a roomful of writers five to seven minutes, tops; then asking afterward, “Who wants to read?” And you know who wants to read? Okay, okay, not everyone. Almost everyone, though. And you know why? Because prompts work, that’s why. Something about a prompt—how it pre-empts thinking; how it circumvents self-doubt; how it forces the issue without forcing it, and there you are five minutes later: you actually began; you actually kept going; you actually have something to show for your efforts, how about that. Write about your favorite punctuation. Consider why you’re not something else—a ballerina, a banker, a biologist instead. Write about what you’d do if you weren’t busy agonizing about not-writing; where and how you’d write: in the car? In the corner deli? On the bed? With a pencil? With a pen? 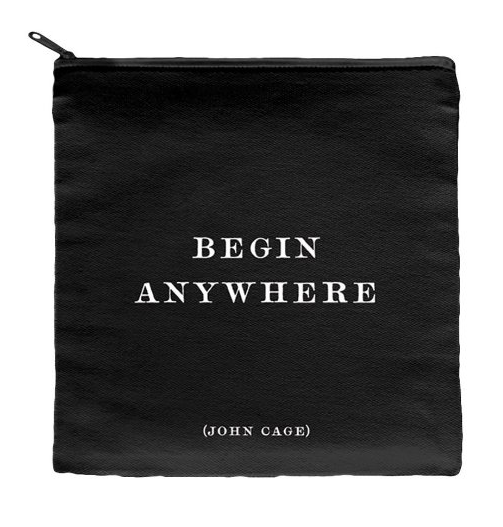 Speaking of which, I have a pen, a gift from a friend, inscribed “Begin Anywhere.” John Cage. But here’s the truth about that pen: I’ll never use it, not to do more than scratch out a grocery list, or sign a W-9, or address an envelope. I can’t write with a pen, that’s all—never mind that pen-to-paper is supposed to help us sift and sort and weigh our words. See, when I was in second grade, when writing was play, when, therefore, I couldn’t get those scenes and the dialog down fast enough, my teacher noticed: whole words and phrases were missing from my stories. Her prescription? Typing lessons. Ever since then I’ve been a slave to the keyboard, where I can just barely keep up. Look here, even now I’ve lost track (imagine if I were using a pen)—and that’s good! That’s a good sign! The point, when following a prompt, is to get the words down as fast as you can. The idea is not to slow down, oh no. Therefore I’m not using my pen; only writing about it; writing about it as fast as I can. Which reminds me (the pen, I mean): I recently published a book about objects. Except, so you know, when I started, it wasn’t a book. Moreover, once it was done it turned out to be not about objects, not really. The objects were only the prompts: only the way into a whole lot of stories I didn’t know I was writing till I wrote them; stories I didn’t know I remembered—or understood—not till after they were written. Stories I couldn’t have written—wouldn’t have had to write—had I’d known. And this is why prologues come last, in fact. And this is why structure is arrived at later than sooner, unless—unless structure itself is the prompt. As in: write the truth about A to B (a letter); tell someone you love how to get to X from Y (directions); instruct your child/friend/lover about how to serve a perfect meal (a recipe); or consider, if you were dead, whom you’d leave your books (your last will and testament). Feel free to digress. I was supposed to be doing this writing. And then I remembered. A week before, at Echo Park Lake, I’d seen a bird lay an egg in the lotuses, no kidding. An American Coot—I looked her up when I got home—black bird with white beak, I typed into Google. Presto: there she was. And, I mean, to witness a bird lay an egg. I had never seen such a thing, not in all my life. And know, I know—birds lay eggs all the time; a dozen eggs in my refrigerator, now, at this moment—it’s not like eggs are a big deal, right? Still, to watch a bird—a wild bird—pick up her rump and drop a perfect oval on a lily pad in a manmade lake not a hundred yards from the freeway? Miraculous. Today, I was supposed to be doing this writing, when I remembered, when I thought to check on that bird. It was midday when I got myself down to the water. The park was busy with people and dogs and paddleboats and ducks and swans. I was almost reluctant to get myself to the spot—afraid I’d find nothing. What do I know about American Coots and their eggs? Maybe they’re breakfast for turtles or snakes; maybe they hatch in a day and fly off to other climes; maybe I’d imagined the whole scene in the first place. But as I got close, sure enough, I saw the nest. Five large eggs—like smooth, gray stones— five that I could see anyway, unattended, I thought, in an elaborate nest woven of lotus leaves. And then I saw the birds—two American Coots, swimming home, each with a frond in its mouth, which it placed just so, and then off they went again, but not far, to find better and more. I stayed for a while, watching from the edge of the water. And that’s what happened while I was supposed to be doing this writing. Dinah Lenney is the author of The Object Parade, recently published by Counterpoint Press. She also wrote Bigger Than Life: A Murder, a Memoir, and co-authored Acting for Young Actors. Her essays and reviews have been published in a wide range of publications and anthologies, among them the Los Angeles Review of Books, The New York Times, The Los Angeles Times, AGNI, Creative Nonfiction, the Kenyon Review, and TriQuarterly. She serves as core faculty for the Bennington Writing Seminars, the Rainier Writing Workshop, and in the Master of Professional Writing program at the University of Southern California. I love the part about how you didn’t know The Object Parade was a book, and the book turned out not to be about objects. I’m having the same experience with my book of essays – a new narrative (so much more authentic and meaningful) is emerging as I develop the manuscript. Maybe that’s the reward for following the prompt wherever it leads. The coot story reminds me of Magritte’s “La Clairvoyance” – the artist looks at an egg and imagines the bird. Thank you for reading—for the images and the thoughts—so helpful to me all round. ah, the egg and how it’s laid. Yes! How’d I miss this… Almost a year ago, too. Thanks. I use writing prompts when I teach, too, and often when I write. I use them because they work; they get things moving a lot faster than thinking/worrying/delaying/regretting/hemming/hawing/etc.